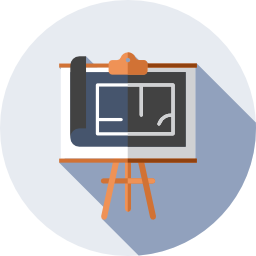 Having gained many years experience and knowledge at a leading kitchen design and construction management company, Mark decided to start his own property refurbishment business. Thus, in 2005 Artisan Company was born. speed on all stages of their refurbishment. We’re very proud of our reputation for designing and building beautiful bathrooms and kitchens for our customers over the years. 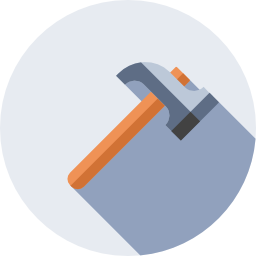 Whether you have designed the bathroom yourself and simply need it installing or require a complete design and build service, we are here to help. 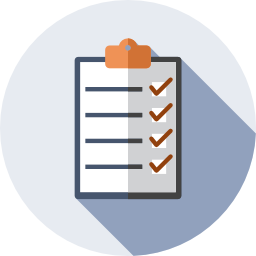 Communication with our customers is key and we will be on hand throughout your project to ensure that everything runs smoothly, on time and to budget, whilst keeping you up to speed on all aspects of your refurbishment. Alternatively, please submit your details below and we will contact you as soon as possible. ©2018. Artisan Bathrooms and Kitchens Ltd. All Rights Reserved. Our client wanted a bathroom that reflected their dream for a calm sanctuary to wash away the demands of life. They wanted a light and airy feel to the bathroom with a sophisticated look that combined traditional styling with a neutral, contemporary palette. This pretty, Victorian property required a full bathroom refurbishment that included the careful removal of a low, lath and plaster ceiling, with the intention of creating a sense of space. Soft white spotlights were installed into the beautifully curved and high, vaulted ceiling. Both ceilings and walls were painted in Farrow & Ball Blackened and were half tiled using contemporary Spanish tiles with a rustic crackled finish in a soft, grey hue. The main wall of the bathroom, which housed the walk in shower area, was fully tiled. 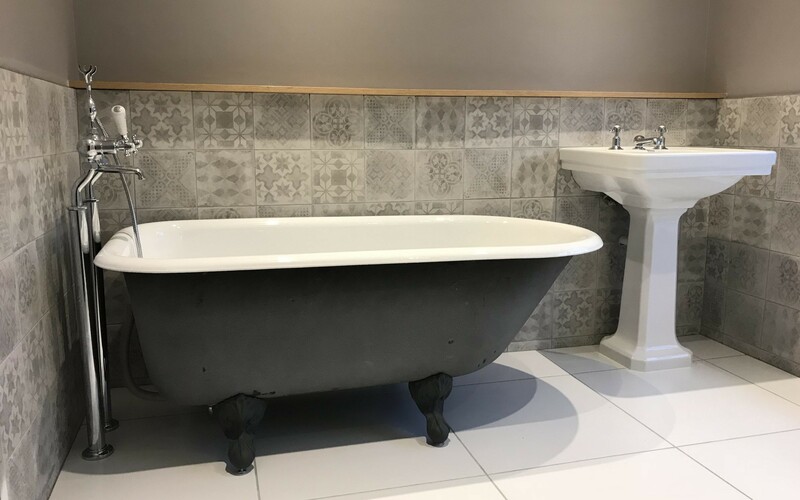 The main focal point of the bathroom was the Clovelly slipper bath from The Cast Iron Bath Company, which was painted in Farrow & Ball Railings. 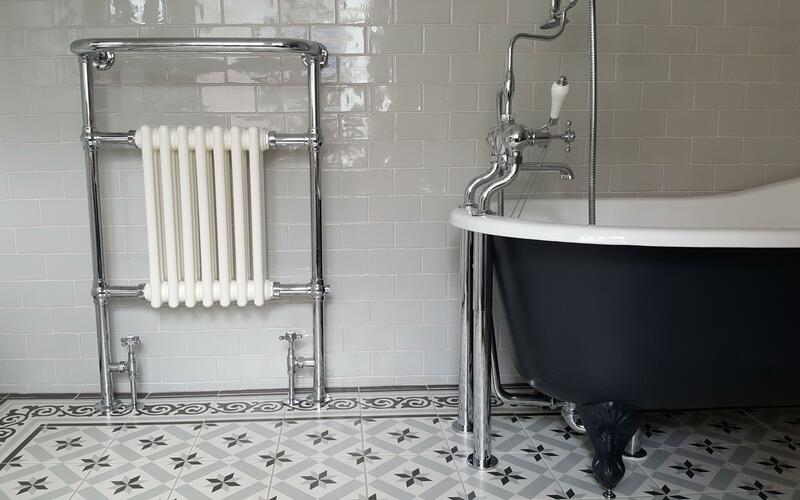 The sanitaryware, radiator, shower and taps were supplied by Burlington Bathrooms and complemented the classic, victorian styling perfectly. The walk in shower area featured a contemporary glass panel and a traditional, exposed thermostatic valve shower with 9 inch rose, resulting in the ultimate luxury showering experience. 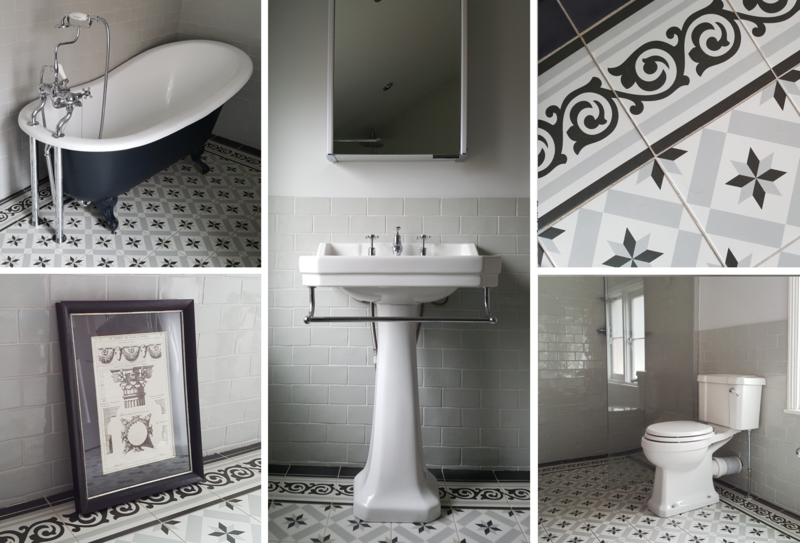 The whole scheme was completed with a chic, geometric patterned tiled floor in a complementary palette, creating a striking finish to the look. 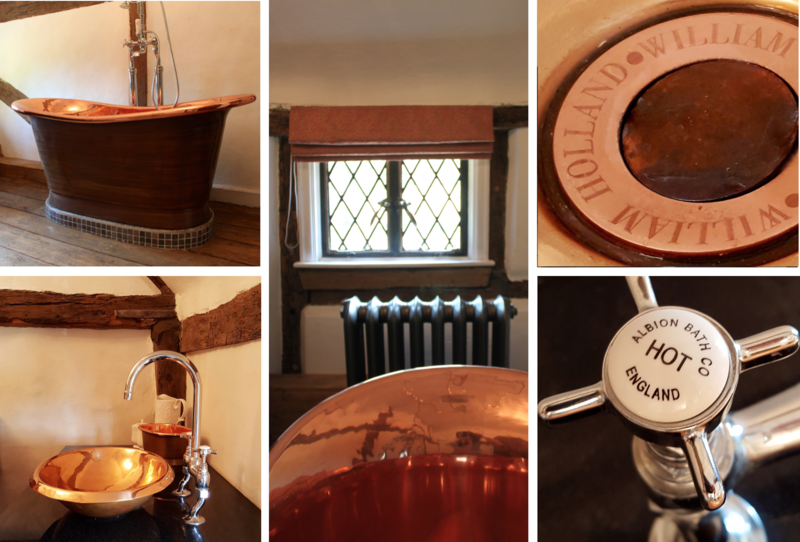 The owners of this beautiful, period property, dating back to the Tudor period, required a striking bathroom that would complement the character and charm of the house. Glazed porcelain mosaic tiles in Highlands Peat Grey from the Mosaic Tile Company were chosen to cover a staged plinth which provided a focal point to display the stunning copper Bateau bath by William Holland Ltd. A Patina exterior and copper interior were chosen for the custom bath to match the surrounding timber beams whilst adding warmth to the colour scheme of the bathroom. 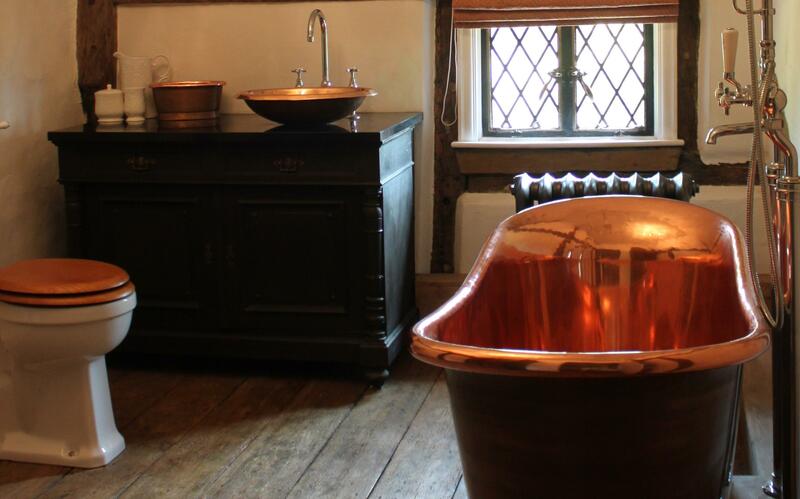 The matching copper Corana basin was installed into a dark wood unit, further complementing the original timber beams in the bathroom. A particular requirement from the client was to replace all pans & cisterns with closed coupled and low level items from Burlington. 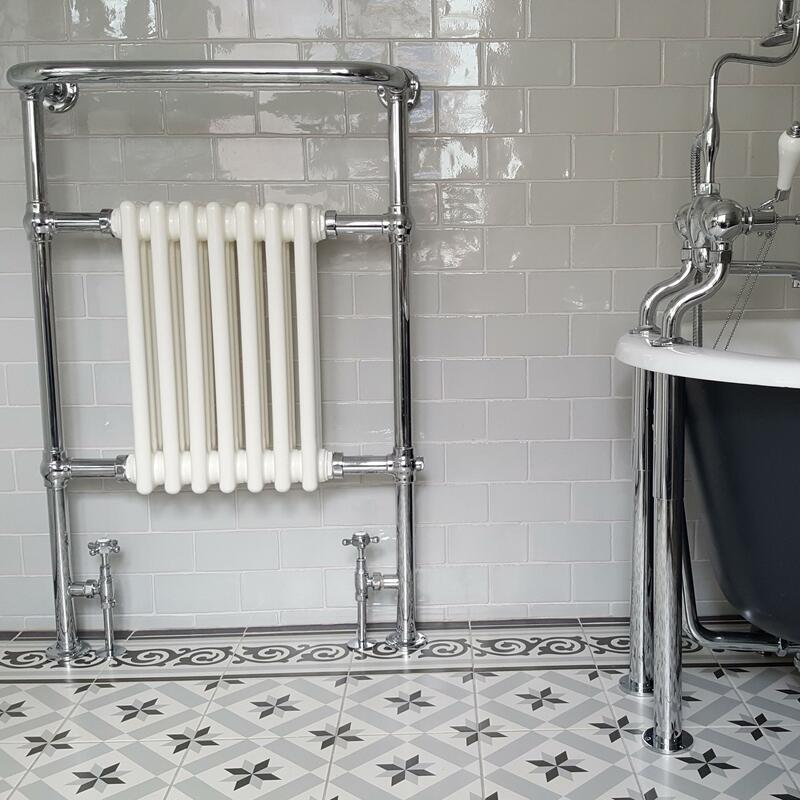 A new heating system was installed and traditional cast iron radiators chosen to complete the look. 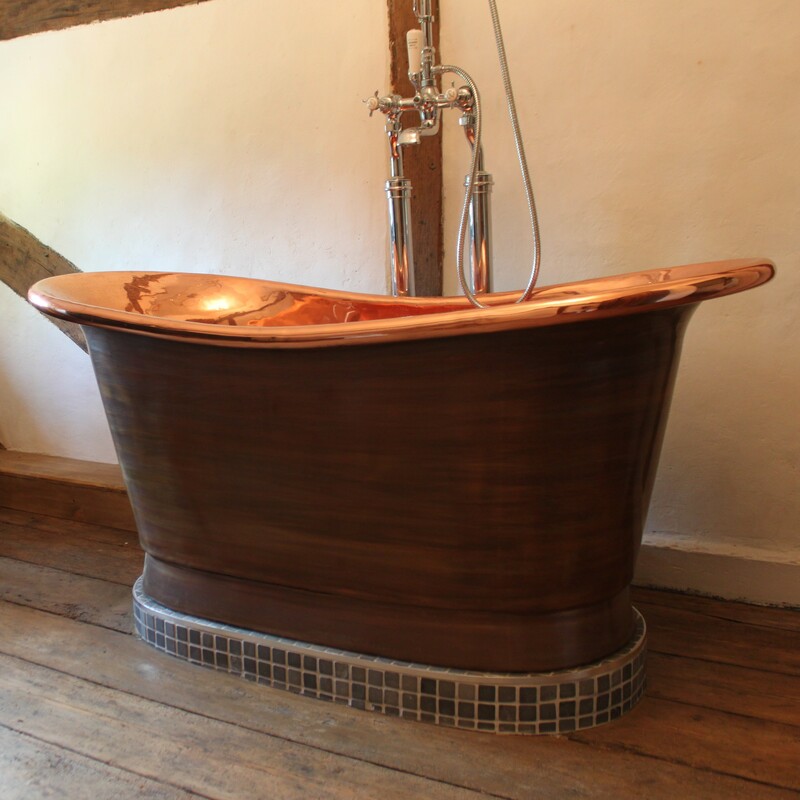 Extra care and attention was paid to encase exposed pipes in stained, natural wood to match the original timbers. 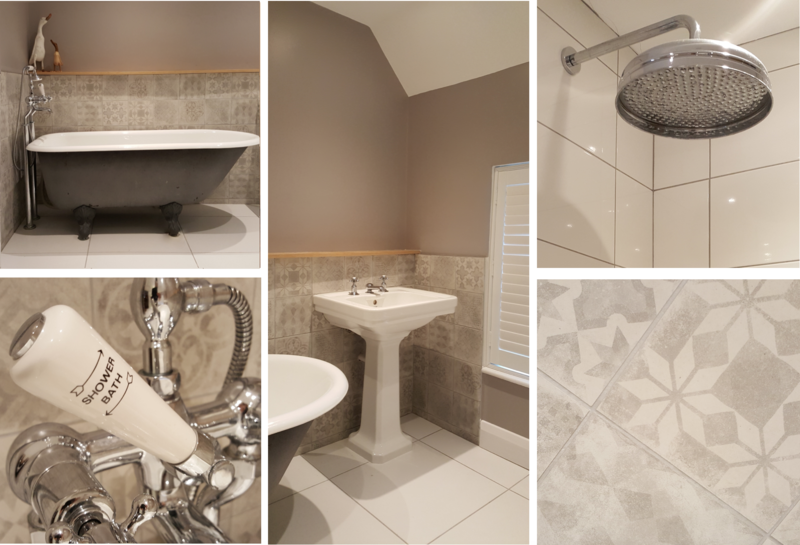 Our client requested the expertise of Artisan Company to transform their upstairs bathroom and separate toilet into a large, contemporary bathroom with sleek and stylish features that all the family could enjoy. In order to create a larger family bathroom space a decision was made to remove a load- bearing wall between an upstairs toilet and separate bathroom. The positioning of the bathroom access point was also moved to further create more space. Large, neutral tiles were used for the floor and walls that were set off against a contrasting feature wall in dark charcoal grey. 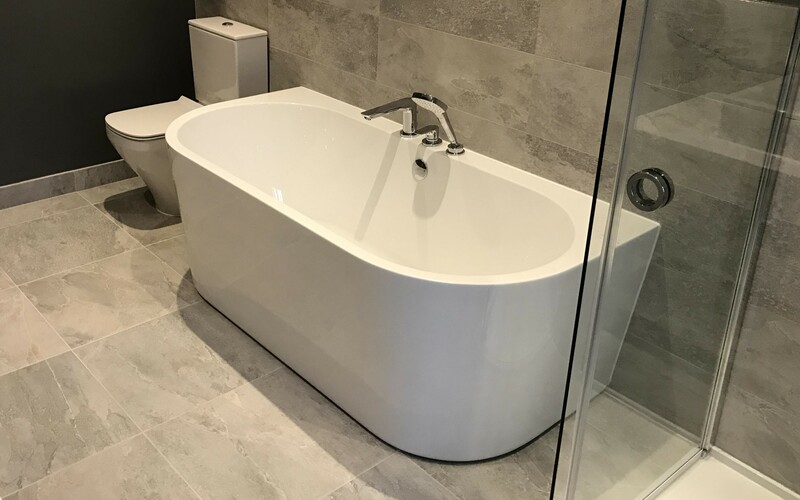 The back to wall, modern classic Drench Ancora bath, matching sanitaryware, seamless Matki shower tray and enclosure gave the room a soft, clean and timeless look. The chic, polished chrome taps, mixers and shower were supplied by Hansgrohe, and were further enhanced by the large, illuminated mirror over the freestanding, light grey sink unit. A similar, sleek design aesthetic was used to refurbish the downstairs wc with bespoke carpentry to house the cistern and stained natural oak shelves to bring a touch of warmth to the room. 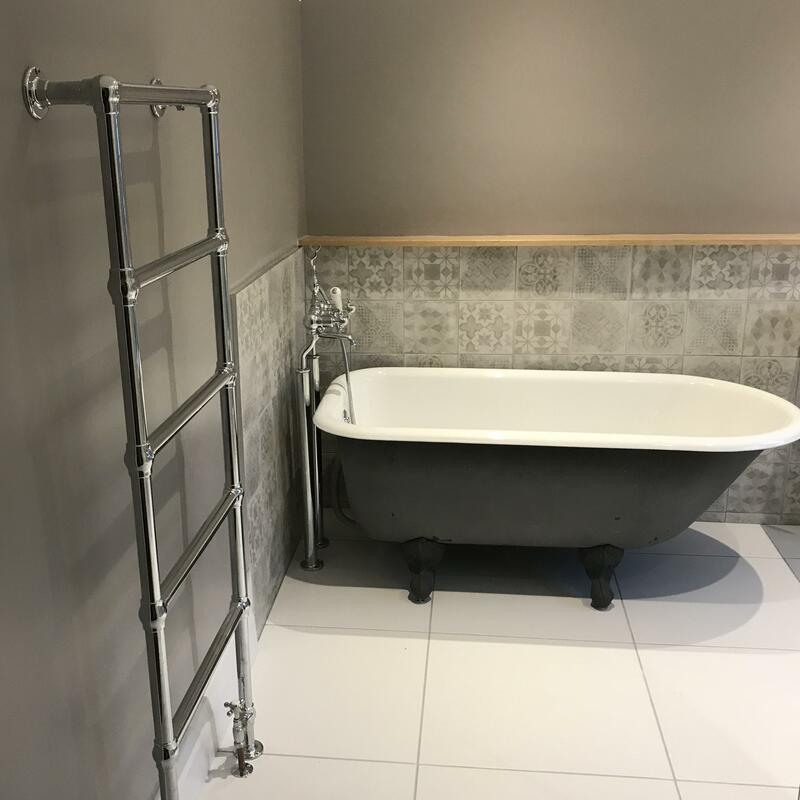 The owners of this period property wanted a full bathroom refurbishment and decoration of the master bedroom and nursery for their new arrival. 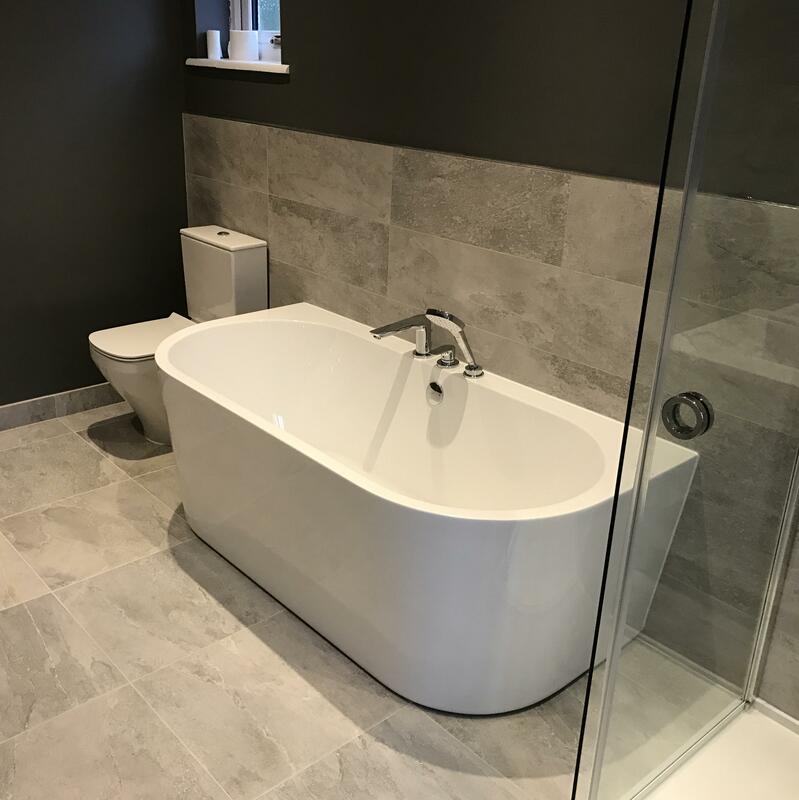 The vision for the bathroom was to combine a traditional feel with a contemporary twist and to investigate the possibility of increasing the space to create a larger, family bathroom. A non-supporting wall, which had previously housed the old cylinder and tank, was removed to allow the room to be opened up into a spacious family bathroom. Soft, neutral french grey and stone shades were used throughout and the walls were half tiled in Fired Earth’s delicately patterned Istria design. A white, American oak shelf was installed bringing a touch of warmth to the bathroom. 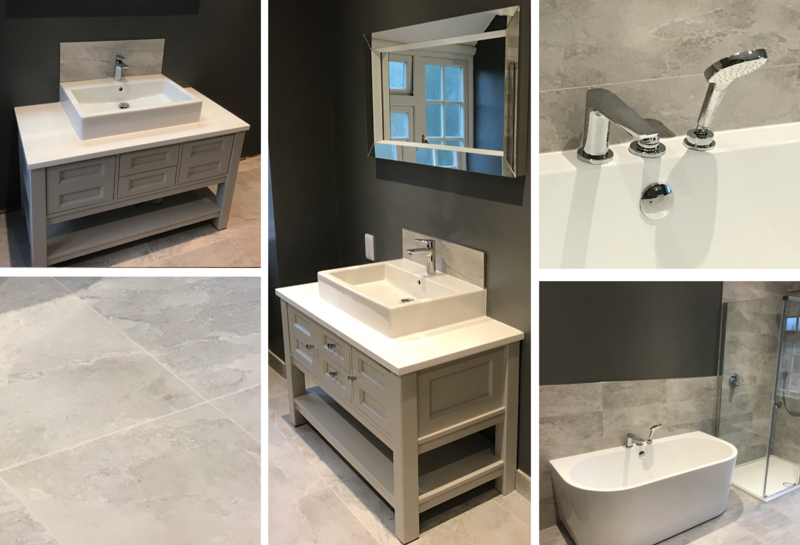 A traditional styled freestanding roll top bath from CP Hart was painted in a complementary deep grey shade, and was complemented with a matching pedestal sink, with taps from Burlington. To add a contemporary element to the bathroom a sleek Matki shower tray and enclosure with Crosswater chrome taps, valve and shower head were combined with large, modern, minimalist white tiles to create a sense of space and light. Due to the age of the property we had to take extra care with the existing walls and used traditional plastering and rendering techniques and materials. Little Greene’s French Grey was used to decorate the master bedroom and whilst decorating we managed to expose original beams at one end of the room, thus creating symmetry in the space. The nursery was decorated in Farrow & Ball’s Middleton Pink, a perfectly delicate and light pastel tone for their new arrival’s room. We were thrilled to redesign and install this kitchen for a client with a real passion for cooking. As our client spends so much time in their kitchen we wanted to design a space that was practical, functional, spacious and light, with appliances fit for the serious cook. 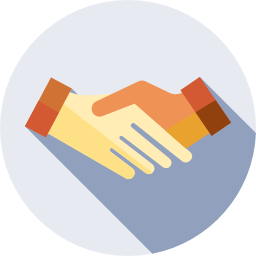 We discussed our client’s wishes at length to ensure that their kitchen space was well executed, meeting all their needs. A substantial extension was built to the rear of the property to allow enough space for a large kitchen, breakfast bar and entertaining area. 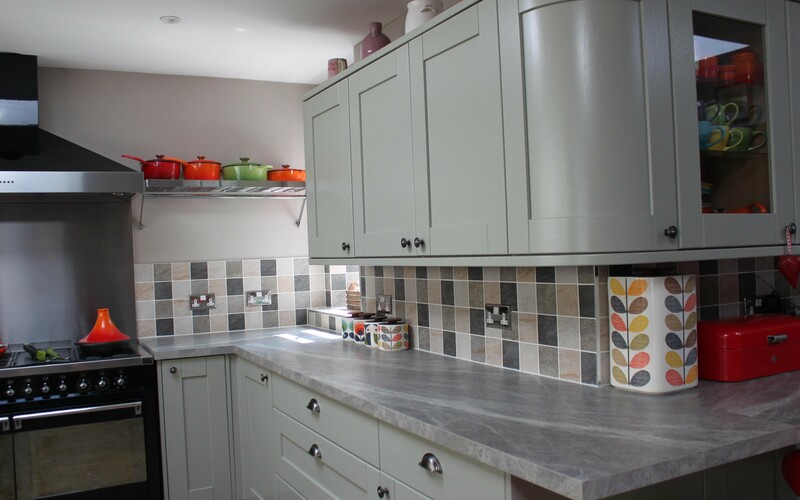 We chose the Tewkesbury range in Skye by Howdens Joinery Co for its simplistic, calm and modern feel, aswell as its extensive range of cabinets, cupboards and decorative accessories. 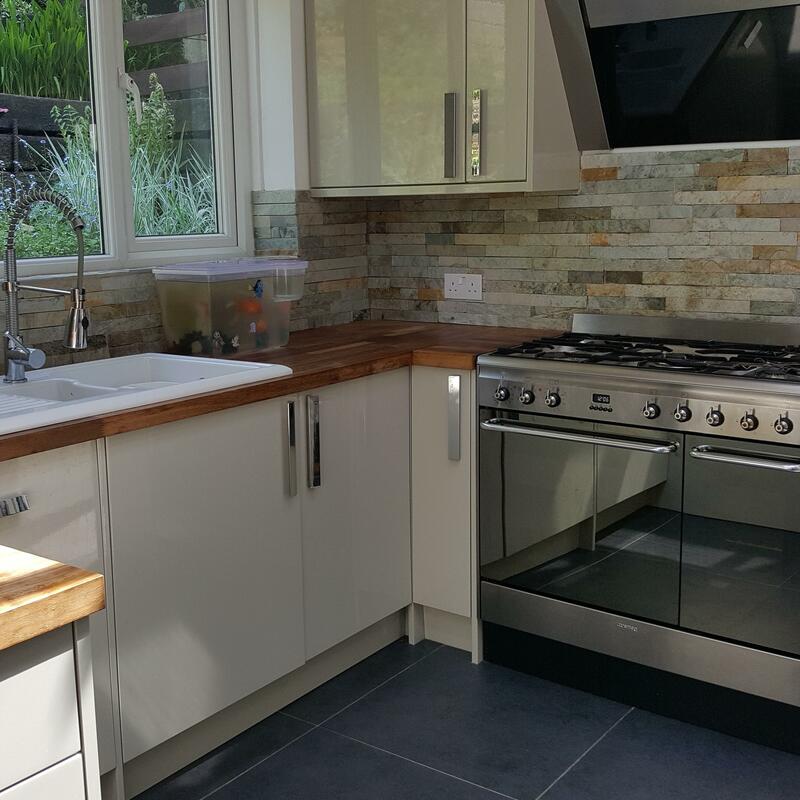 The range enabled us to design key features such as the wrap around kitchen with adjoining breakfast bar effectively, using both solid and glass panelled doors to add variety. 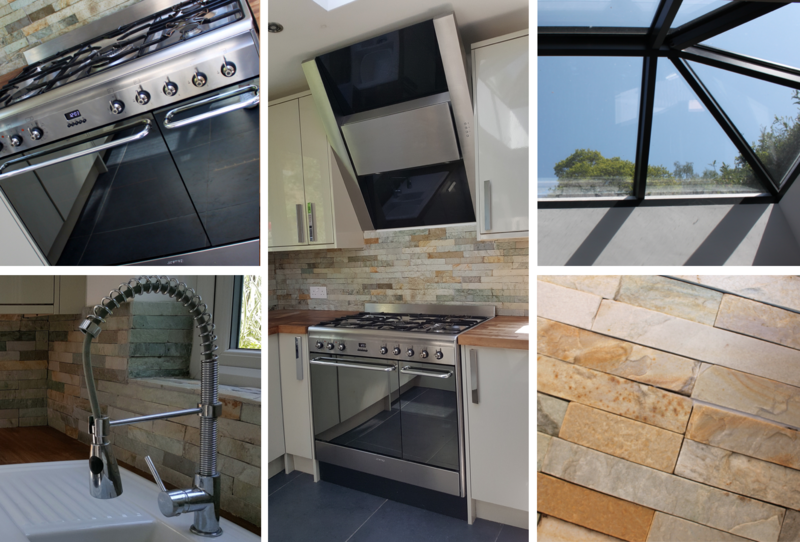 Worktops were supplied in a natural grey stone effect and were complemented with natural stone wall tiles in grey and stone hues. The centrepiece of the kitchen was the large black and stainless steel Smeg Opera dual cavity cooker and hood. 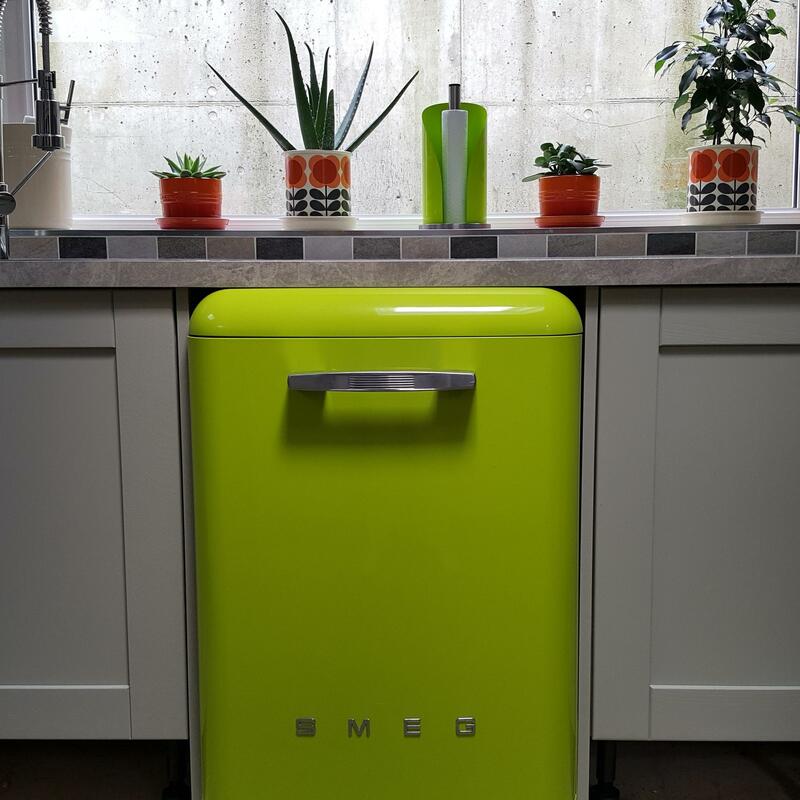 Appliances were supplied by Smeg in striking reds and lime greens to give the kitchen a vibrant twist and were beautifully coordinated with items from the Orla Kiely kitchen range and Le Creuset cookware in bright Volcanic and Rosemary. Our client wanted to create a wonderful, communal hub where the family could spend quality time cooking, entertaining and relaxing. The vision to create an open plan kitchen and dining area required a considerable amount of planning, considered design and structural work. A key element to this project was to maximise light and create a sense of space. In order to create a lovely open plan space we opened up the existing entrance between the kitchen and dining room, to house a new kitchen, breakfast bar and large family dining area. A 2.5 metre anthracite roof lantern with GRP mid grey roof covering was installed over the kitchen area to increase the amount of natural light and further enhance the feeling of space. Our client wanted a clean, contemporary kitchen combined with warm, rustic touches. 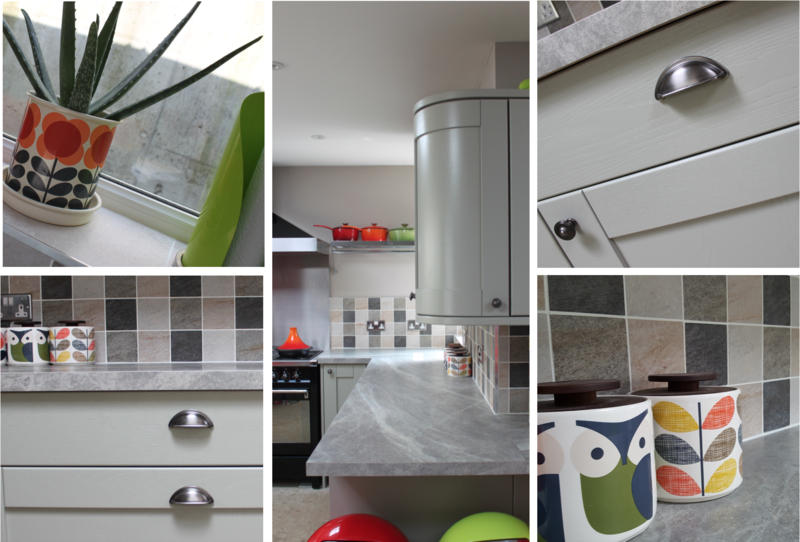 To answer the brief we chose the smooth, sleek lines of the Glendevon range by Howdens Joinery Co in Gloss Grey. The units were contrasted beautifully with rich iroko solid wood worktops, and walls were painted in Little Greene’s Slaked Lime to give a warm and soft appearance. To complete the look multicoloured, Riven Slate Grey wall tiles were added to create a striking multi-level, textured appearance, whilst anthracite porcelain floor tiles made a bold statement throughout the space. All tiles were supplied by Marble Mosaics. The vision to create an open plan kitchen and dining area required a considerable amount of planning, considered design and structural work. 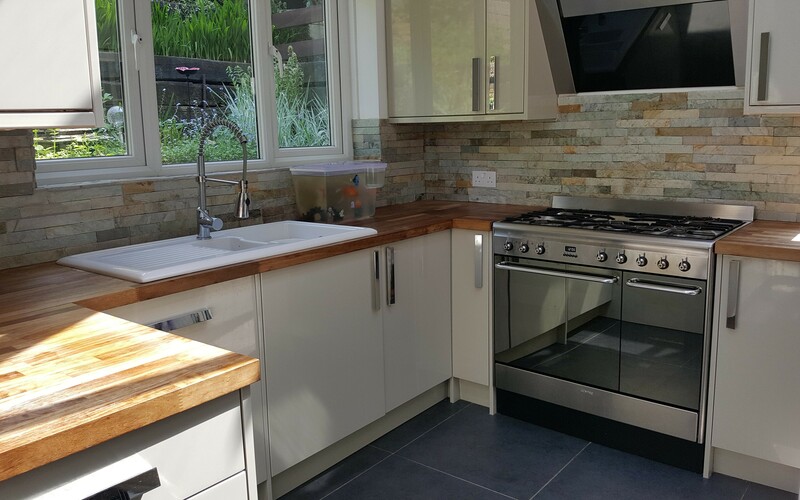 To complement the modern kitchen units we installed Smeg appliances from their contemporary, yet timeless ‘Classic’ range including a 90cm cooker, downdraft hood and integrated microwave and dishwasher. A large, American style fridge freezer was supplied by Samsung.